Excellent quality and look for our living room! The high attention to detail is really shown in this floor art. Everyone who comes over gives us compliments on the look. 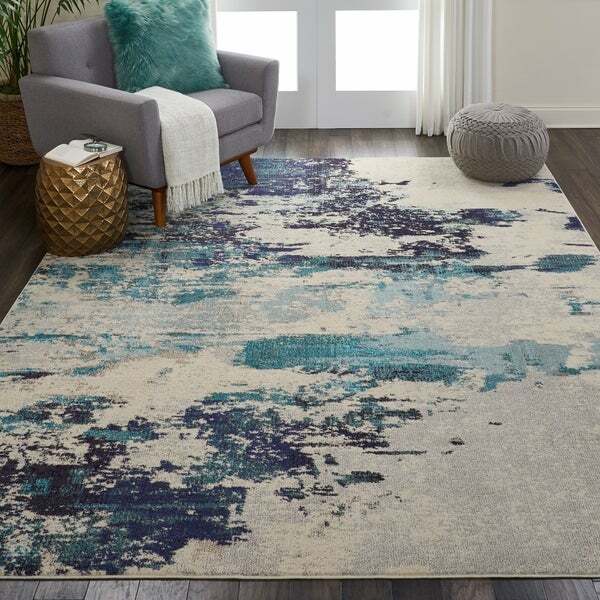 Nourison Celestial Ivory Teal Blue Abstract Area Rug - 5'3" x 7'3"
Nourison Celestial Ivory Teal Blue Abstract Area Rug - 6'7" x 9'7"
Nourison Celestial Ivory Teal Blue Abstract Area Rug - 3'11" x 5'11"
Cosmic consciousness inspires the Celestial Collection by Nourison. These heavenly area rugs possess a dramatic beauty, with rich, saturated colors that swirl together in unique and vivid designs. Each stunning area rug conveys a sense of movement and energy that verges on divine. Serene shades of blue and navy wash over this Celestial Collection rug, creating a contemporary feel with a touch of coastal décor. Silky texture and a peaceful ivory field bring casual comfort to any room in the home. Dimensions 144.0 In. X 108.0 In. X 0.5 In. Beautiful rug! The colors are exactly as pictured. I love it! Get lots of compliments on the rug. Perfect for my space. Very happy with this purchase. It is just what is pictured and came well wrapped and on time.